Outdoor News is mailed directly into the homes of avid outdoor enthusiasts who have voted with their wallet to receive the publication. Compounded with a strong newsstand presence, our advertisers have greater confidence their message will hit the mark. Our paid subscribers and newsstand distribution provide the most thorough coverage available in outdoor publishing across the Great Lake States. Combine all seven states, and compare us to any other outdoor publication. We have certified circulation audited by the U.S. Postal Service, and we can back it up with real numbers and proven delivery. It’s how we do business. Helpful, honest, reliable, consistent, and dependable are just a few of the adjectives our advertisers use to describe Outdoor News. From our efforts to ensure your success, to the final delivery of our publications, you know you are getting honest pricing for a quality product. Our frequency provides shorter lead times, resulting in greater flexibility for our advertisers. The increased frequency benefits our subscribers, too. Fresh and relevant news coverage provides more thorough readership and better advertising response. 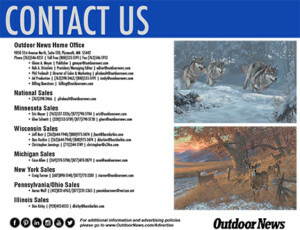 Outdoor News promotes subscription sales by directly mailing copies of the paper to potential subscribers, distributing extra copies at over 70 sport shows and expos annually, and providing promotional copies at many conservation group banquets and other events. Outdoor News offers a quality product for a fair price, and the best part is you can mix and match to meet your promotional objectives. You don’t need to make a package buy. Pick the states where you want to advertise and precisely target your message. Excellent coverage, honest and dependable circulation numbers, high frequency to make your message more effective, additional promotional copies at no extra charge, great rates, and a team dedicated to your success. Those are just some of the benefits of advertising with Outdoor News! Hunters, anglers and outdoor enthusiasts rely on Outdoor News to provide the most up-to-date outdoor information available. With newspapers in seven states and a popular website, outdoor enthusiasts count on Outdoor News for the very best in local outdoor information. Checkout our media kits, sample papers, and editorial calendars to learn more about us. While we see many publications that don’t offer you the option to view their product data, or attempting to hide their publisher’s statements in small font type back in an obscure location, you’ll find that we make our information readily available. Outdoor News is published in Minnesota 52 times a year, and in Wisconsin, Michigan, Illinois, Ohio, Pennsylvania and New York 26 times a year making us the most up-to-date source of local outdoor information available. Locally written hunting and fishing tips and techniques. In-depth coverage and analysis of state and national outdoor agencies. Local lake maps and fishing reports. The best outdoor columnists and writers in each state. Everything related to hunting, fishing, and conservation.